These days, I’ve been in hiding. My activist streak has been under the covers, bundled in blankets, and cozy warm away from the messy unjust world. I run a business. I work hard. I volunteer. I cook dinner for my family. I recycle. I connect with friends. I drink organic tea and meditate (not usually together). I’m also new mom. My kid is now a ripe, old, seven weeks outside of the womb, infant. I’m learning how to parent. When I’m not sleeping or working, I’ve been spending time reading (and listening to) books, podcasts, and blogs about being a good mother, helping my kid get enough sleep, eat well, and learning how to find new-to-me community including mom therapist groups, queer mom support, and Jewish parent connections. I’ve let myself be scooped up by the 24-7 tasks of being a parent, and a new one at that. Except that I’m white and I’ve been using my white privilege to take a break from thinking about racism. Because I’m white, and white supremacy and white privilege exist, I do not have to deal with my internalized racism unless I make myself and these days, I haven’t been making myself confront racism, external or internal. Here are some definitions of white privilege and white supremacy for those who want to learn more. I used to respond when I heard of unjust going-ons and I did not react when I heard 45’s recent vile racist comments about Haiti and African nations. I felt utterly shocked into silence and horror. I became nervous and scared. I comforted myself with baby snuggles and moored myself to the rhythm that my life has afforded me: little sleep with constant tasks, hardly a moment to cry out about the government or find ways to rebel. After reading an article that a friend posted on social media, I realized that I didn’t want to stay silent and that, for me, speaking up was the healthiest thing to do. I realized that I wanted time to increase my knowledge. I decided to carve away a few hours a week to learn how to be a better anti-racism activist. It’s 1 am now. I’m right in the middle of feedings. My baby is asleep and so is my wife. While they rest up, I’m forgoing sleep for an hour or two to write this post. I’m doing so because I want to break through my numbness and take a stand. I believe that our president says racist things and that it is not okay. I know I must work for justice in order to live in a more just world. 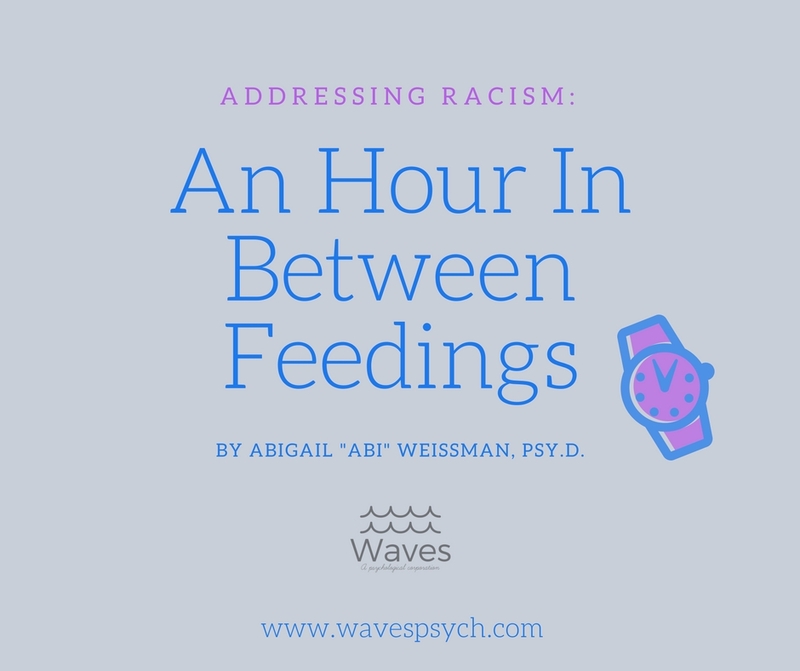 I will spend at least one hour a week in between feedings, as health allows, to learn about white supremacy, institutional racism, and oppression in order to defeat it. I want to be a better ally to people of color. How will you combat racism? How do you remember to keep fighting for justice even when you want to give up? What are your favorite books and articles and podcasts to read on these and other related topics? Let’s connect over how we will work to have a better world.